The city of Vitoria-Gasteiz (Vitoria being its Spanish name and Gasteiz its name in the Basque language) is the capital of the Spanish Autonomous Region of the Basque Provinces and of the province of Álava. It is, after Bilbao, the region's second largest city and its Basque name, Gasteiz, was officially added in 1983, although people refer to it as one or the other according to their linguistic background. Vitoria-Gasteiz is an important industrial centre. It has the second highest standard of living in Spain, and is also (statistically) the greenest city in Europe due to its numerous parks, avenues and green areas. In the partly walled old city there are a cathedral (12th to 14th century) and several churches dating from the 15th century. 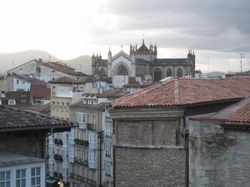 Another remarkable feature of Vitoria-Gasteiz are its many cultural centres. These impart fully subsidised courses and programmes for local inhabitants and are unique in the Basque Provinces. The city is also popular with tourists, many of whom come to visit its numerous museums, which they can travel between using the free park-and-ride urban bicycle service.